You are here: Home / Festival Coverage / Indie / Festival Preview: Moon River Festival is back! Festival Preview: Moon River Festival is back! Reviewed by Keely Caulder on July 5, 2018 . Festival Preview: Moon River Festival is back! Moon River Festival is back! And this time, it’s bigger and better. Presented by Drew Holcomb & the Neighbors, the country folk festival will take place over the course of two days in Chattanooga, Tennessee. 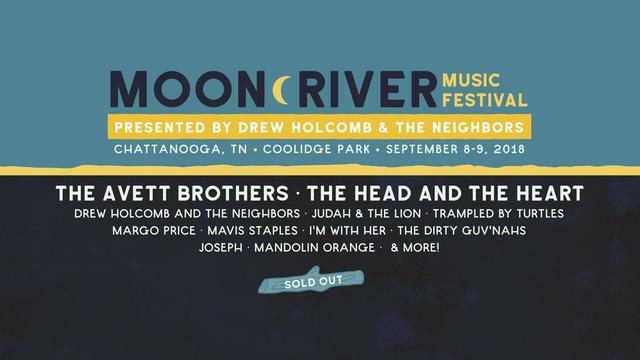 Right along the Tennessee River, acts such as The Avett Brothers, Judah & the Lion, The Head and The Heart, and of course, Drew Holcomb & the Neighbors will take the stage. Creating the festival in 2014 in order to promote Memphis, Holcomb’s hometown, he and the band worked hard to create an incredible experience for those who attended. Outgrowing Moon River’s past venue in Memphis, The Levitt Shell, this year, the festival will be held at Coolidge Park. Moon River will showcase 22 acts on the 8th and 9th of September. In a letter written about the move, Holcomb discussed his excitement for the festival’s new location. Drew Holcomb’s ability to curate the festival to the liking of fans was on spot. Giving many up-and-coming bands a slot at the festival not only contributes to the sense of community, but will also introduce many fans to new favorite artists. Holcomb’s festival is not the only thing he is a part of within the music industry. Aside from Moon River, he performs solo as well as with his band, Drew Holcomb & the Neighbors, and runs Magnolia Record Club. Each month he selects one album to give to subscribers on vinyl. Many of the artists on this year’s lineup have been selected for distribution in the club. There are many bands you should try to catch aside from the headliners while at Moon River. Joseph, a folk trio made up of sisters hailing from Oregon, will likely blow you away with their talented harmonies and boot stomping acoustic anthems. Boy Named Banjo, a country/bluegrass band that has been creating quite the talk in Nashville, will welcome you with their sweet Southern sound and have you dancing in no time to the sound of their catchy banjo licks. Caamp, a folk power duo, who recently was on tour with Rainbow Kitten Surprise, will give you a good summertime feel as lead singer Taylor Meier woos you with his raspy voice. Another includes Penny and Sparrow, a duo falling under the indie folk category. Composed of singer/songwriters Andy Baxter and Kyle Jahnke, their quirky chemistry and unbelievable ability to fill your heart with warm ballads will likely leave you speechless. Moon River sold out the day it went on sale. To be exact, it sold out in eight hours. With such a stacked lineup, it’s hard to blame anyone wanting to go. Enjoyable music mixed with a beautiful backdrop of the city will make for an incredible two days. Intimate for a festival, Coolidge Park holds 10,000 people and will be engaging for fans of all ages. As Holcomb is focused on maintaining a community feel for the festival, Moon River will be a perfect way to celebrate summer. Visit the Moon River website for tickets, FAQ’s, and all of your Festival info!